Have you ever wondered what it takes to hand-knit one of our popular, adorable puppets? Watch master knitter Veronica Cruz as she brings the Little Bear Puppet to life in Puno, Peru! Have you ever wondered what it takes to hand-knit our adorable alpaca wool ornaments? 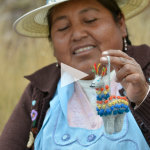 Watch Elvira, one of our talented knitters from Puno, Peru, create an alpaca ornament!